Jonathan Ray reveals the best cellars to set sail for if your superyacht’s wine supplies are running low 1. Conrad Maldives Location The Maldives are the perfect spot for superyacht lovers, given that they consist of 1,200 far- flung islands lying, on average, a mere 1.5 metres above sea level. Conrad Maldives Rangali Island, an outpost of the Hilton chain, is just two minuscule islands (joined by a footbridge) that can be reached directly by superyacht or a 30-minute seaplane flight from the capital, Malé. 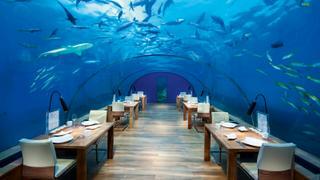 Why it’s special The resort is famed for its seven restaurants, most notably Ithaa, the world’s first all-glass underwater restaurant. The property is also set to debut its one-of-a-kind underwater residence before the end of the year. What to look for The fabulous cellar – the first underground store of its kind in all the Maldives, located two metres below sea level – which plays host to all manner of private tastings. Enjoy a five-course dinner in the company of the head sommelier, who will match the food to eight different wines. Best bit The manager’s regular Pol Roger champagne receptions on the beach for newly arrived guests. Top tip Confound yourself and your fellow guests by using the sommelier’s black Riedel blind-tasting glasses. Location The Maldives are the perfect spot for superyacht lovers, given that they consist of 1,200 far- flung islands lying, on average, a mere 1.5 metres above sea level. Conrad Maldives Rangali Island, an outpost of the Hilton chain, is just two minuscule islands (joined by a footbridge) that can be reached directly by superyacht or a 30-minute seaplane flight from the capital, Malé. Why it’s special The resort is famed for its seven restaurants, most notably Ithaa, the world’s first all-glass underwater restaurant. The property is also set to debut its one-of-a-kind underwater residence before the end of the year. What to look for The fabulous cellar – the first underground store of its kind in all the Maldives, located two metres below sea level – which plays host to all manner of private tastings. Enjoy a five-course dinner in the company of the head sommelier, who will match the food to eight different wines. Best bit The manager’s regular Pol Roger champagne receptions on the beach for newly arrived guests. Top tip Confound yourself and your fellow guests by using the sommelier’s black Riedel blind-tasting glasses. 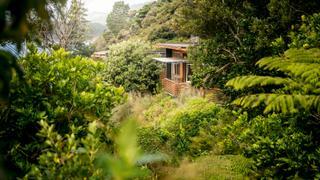 Location A blessed spot in the exquisite Marlborough Sounds in the north of New Zealand’s South Island, the Bay of Many Coves is but a short sail from Wellington. Best of all, you can moor up your superyacht right outside and, while dining on the terrace, hug yourself with glee at the beauty of your craft just metres away. Why it’s special Although easily accessible by sea, the Bay of Many Coves is difficult to get to any other way, and it’s ideal for seafarers seeking a bit of land-based luxury. Not only that, Marlborough is New Zealand’s foremost wine region, and its fabled wineries welcome visitors with excellent tours, tastings and restaurants. What to look for Taittinger champagne by the glass when you arrive, and a selection of New Zealand’s nest wines alongside the freshest seafood, lamb and beef. The region has exceptional produce, and much of it is organic. Best bit A glass of Seresin Sun & Moon Pinot Noir on the terrace at dusk. Top tip Head to Picton, hire a driver and spend a day visiting Marlborough’s nest wineries. Location A blessed spot in the exquisite Marlborough Sounds in the north of New Zealand’s South Island, the Bay of Many Coves is but a short sail from Wellington. Best of all, you can moor up your superyacht right outside and, while dining on the terrace, hug yourself with glee at the beauty of your craft just metres away. Why it’s special Although easily accessible by sea, the Bay of Many Coves is difficult to get to any other way, and it’s ideal for seafarers seeking a bit of land-based luxury. Not only that, Marlborough is New Zealand’s foremost wine region, and its fabled wineries welcome visitors with excellent tours, tastings and restaurants. What to look for Taittinger champagne by the glass when you arrive, and a selection of New Zealand’s nest wines alongside the freshest seafood, lamb and beef. The region has exceptional produce, and much of it is organic. Best bit A glass of Seresin Sun & Moon Pinot Noir on the terrace at dusk. Top tip Head to Picton, hire a driver and spend a day visiting Marlborough’s nest wineries. 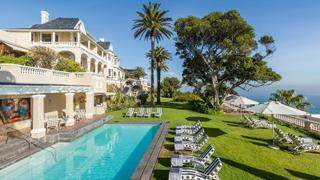 Location The Edwardian mansion that is Ellerman House has the best sea views in all Cape Town, set high above the ocean in Bantry Bay. The Port of Cape Town is 10 minutes away by car. 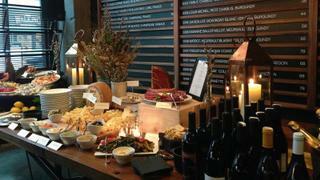 First-rate restaurants such as the Pot Luck Club and the Test Kitchen are easily accessible. Why it’s special Ellerman House boasts 11 rooms, two suites and two three-bedroom villas, and there’s a library, a spa, swimming pool, two lounges and three outdoor terraces. Best of all, there’s a brandy lounge, a wine gallery and a champagne cellar. What to look for The astonishing corkscrew-shaped wine gallery, surely the only such creation in the world. It’s stocked with 7,500 di erent bottles, representing the cream of South Africa’s wines, many of them rare treats bought especially at auction. Guests have access to an iPad providing detailed notes on every wine in the collection. Best bit The champagne cellar, stocked exclusively with rare and special vintages of Dom Pérignon champagne. Top tip Take advantage of your proximity to South Africa’s Winelands and head out on a bespoke tour to Stellenbosch, Hemel-en-Aarde or Constantia. Location The Edwardian mansion that is Ellerman House has the best sea views in all Cape Town, set high above the ocean in Bantry Bay. The Port of Cape Town is 10 minutes away by car. First-rate restaurants such as the Pot Luck Club and the Test Kitchen are easily accessible. Why it’s special Ellerman House boasts 11 rooms, two suites and two three-bedroom villas, and there’s a library, a spa, swimming pool, two lounges and three outdoor terraces. Best of all, there’s a brandy lounge, a wine gallery and a champagne cellar. What to look for The astonishing corkscrew-shaped wine gallery, surely the only such creation in the world. It’s stocked with 7,500 di erent bottles, representing the cream of South Africa’s wines, many of them rare treats bought especially at auction. Guests have access to an iPad providing detailed notes on every wine in the collection. Best bit The champagne cellar, stocked exclusively with rare and special vintages of Dom Pérignon champagne. Top tip Take advantage of your proximity to South Africa’s Winelands and head out on a bespoke tour to Stellenbosch, Hemel-en-Aarde or Constantia. Location Set high on the hill above Vila Nova de Gaia, the city where all the famous port producers have their lodges (the cellars in which the ports made in the Douro Valley mature), the Yeatman has a truly striking view of neighbouring Porto across the River Douro. And now that Douro Marina has been refurbished and enlarged (it contains a state-of-the-art refuelling facility and can accommodate yachts up to 50 metres), it makes a fine stopping-off point en route to or from the Mediterranean. 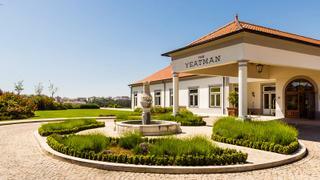 Why it’s special The Yeatman’s wine cellar is vast, comprising well over 25,000 bottles. No other hotel or restaurant in the world has such a wide range of vintage or tawny ports, many of them seldom found anywhere else. What to look for The Portuguese wine masterclass featuring 10 to 12 wines, led by the Yeatman’s wine director Beatriz Machado. Best bit A pre-dinner spell in the Caudalie Vinothérapie Spa, with its skincare products and therapies incorporating extracts from wine. Top tip All the major port lodges are within strolling distance and all host great tastings and tours, so take advantage. Graham’s, Taylor’s and Ramos Pinto are the best. Location Set high on the hill above Vila Nova de Gaia, the city where all the famous port producers have their lodges (the cellars in which the ports made in the Douro Valley mature), the Yeatman has a truly striking view of neighbouring Porto across the River Douro. And now that Douro Marina has been refurbished and enlarged (it contains a state-of-the-art refuelling facility and can accommodate yachts up to 50 metres), it makes a fine stopping-off point en route to or from the Mediterranean. 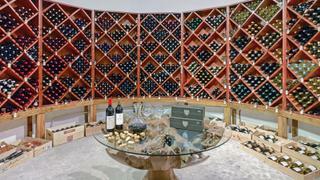 Why it’s special The Yeatman’s wine cellar is vast, comprising well over 25,000 bottles. No other hotel or restaurant in the world has such a wide range of vintage or tawny ports, many of them seldom found anywhere else. What to look for The Portuguese wine masterclass featuring 10 to 12 wines, led by the Yeatman’s wine director Beatriz Machado. Best bit A pre-dinner spell in the Caudalie Vinothérapie Spa, with its skincare products and therapies incorporating extracts from wine. Top tip All the major port lodges are within strolling distance and all host great tastings and tours, so take advantage. Graham’s, Taylor’s and Ramos Pinto are the best. 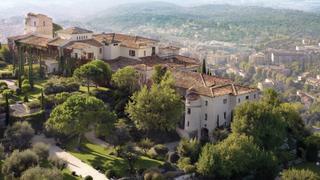 Location Château Saint-Martin is part of the excellent Oetker Collection and is set in 13.7 hectares, high in the hills of Vence. A much-loved icon of the French Riviera, the resort is blessed with its own private helipad and is therefore just 10 minutes from the superyacht hub of Monaco. Why it’s special It’s the perfect haunt for well-heeled wine lovers, thanks to its Michelin-starred restaurant Le Saint- Martin, and the outdoor L’Oliveraie, serving exquisite Mediterranean food matched to local wines. The best spot of all, though, is the dramatic underground cellar, hewn deep into the bedrock beneath the hotel. What to look for The weekly Les Canthares Wine Tasting and Dinner hosted by head sommelier Géraud Tournier, with dishes created by Michelin-starred chef Jean-Luc Lefrançois to match the wines. Best bit All the wine-tasting packages available, including the Provencal Tasting, the Chardonnay Tasting or the Champagne Tasting for Two. Top tip Delve into the 8,000-bottle wine list, where treats include 2009 Jean-Louis Chave Hermitage Cuvée Cathelin, 2015 Domaine Tessier Meursault 1er Cru and 2007 Domaine Tempier Bandol Cuvée La Migoua. Location Château Saint-Martin is part of the excellent Oetker Collection and is set in 13.7 hectares, high in the hills of Vence. A much-loved icon of the French Riviera, the resort is blessed with its own private helipad and is therefore just 10 minutes from the superyacht hub of Monaco. Why it’s special It’s the perfect haunt for well-heeled wine lovers, thanks to its Michelin-starred restaurant Le Saint- Martin, and the outdoor L’Oliveraie, serving exquisite Mediterranean food matched to local wines. The best spot of all, though, is the dramatic underground cellar, hewn deep into the bedrock beneath the hotel. What to look for The weekly Les Canthares Wine Tasting and Dinner hosted by head sommelier Géraud Tournier, with dishes created by Michelin-starred chef Jean-Luc Lefrançois to match the wines. Best bit All the wine-tasting packages available, including the Provencal Tasting, the Chardonnay Tasting or the Champagne Tasting for Two. Top tip Delve into the 8,000-bottle wine list, where treats include 2009 Jean-Louis Chave Hermitage Cuvée Cathelin, 2015 Domaine Tessier Meursault 1er Cru and 2007 Domaine Tempier Bandol Cuvée La Migoua. Location Petit St Vincent is a tiny private island and boutique beach resort located in the southern tip of the Grenadines. It’s a veritable superyacht paradise, with islands such as Carriacou to the south-west and Union and Mayreau to the north. Why it’s special It’s unusual because it is private and secluded, with accommodation divided between 22 one- and two-bedroom cottages scattered about the island. There is no internet, no television and no telephones. What to look for The cellar is the big draw here, a circular temple to wine filled with some 4,500 bottles including the finest first growths from Bordeaux, vintage champagne, top red burgundy and the very best vintages of Penfolds Grange, known as Australia’s first growth. Best bit Rum lovers also get a look in, with a remarkable selection of barrel-aged varieties sourced from across the Caribbean. Top tip As there are no telephones, in order to alert staff that you’re ready to enjoy a chilled bottle of provençal rosé in your bath, you must run up a yellow flag outside your villa. Location Petit St Vincent is a tiny private island and boutique beach resort located in the southern tip of the Grenadines. It’s a veritable superyacht paradise, with islands such as Carriacou to the south-west and Union and Mayreau to the north. Why it’s special It’s unusual because it is private and secluded, with accommodation divided between 22 one- and two-bedroom cottages scattered about the island. There is no internet, no television and no telephones. What to look for The cellar is the big draw here, a circular temple to wine filled with some 4,500 bottles including the finest first growths from Bordeaux, vintage champagne, top red burgundy and the very best vintages of Penfolds Grange, known as Australia’s first growth. Best bit Rum lovers also get a look in, with a remarkable selection of barrel-aged varieties sourced from across the Caribbean. Top tip As there are no telephones, in order to alert staff that you’re ready to enjoy a chilled bottle of provençal rosé in your bath, you must run up a yellow flag outside your villa. Location After visiting Napa and Sonoma, cruise north in your superyacht along the West Coast and negotiate your way into Puget Sound. Drop anchor in Elliott Bay alongside Seattle and head straight for RN74, the temple to fine modern French/ American cuisine on Fourth Avenue and Pike Street. Why it’s special The restaurant (named after the major road in Burgundy) was founded by celebrity chef Michael Mina, and although its sister establishment in San Francisco has closed, Seattle’s outpost goes from strength to strength, boasting what must surely be the city’s nest wine list. What to look for The 89-page document is truly spectacular and would do credit to the grandest and most famous of European hotels. There are 27 different Nebbiolos from Italy; 39 sweet and fortifed wines; 113 Rhône wines; not to mention 32 red burgundies from Volnay alone; as well as 32 different Washington State wineries in multiple cuvées and vintages. Best bit The five-course tasting menu with wines to match. Top tip After lunch, stroll down to Pike Place Market, generally acknowledged as one of – if not the – finest food markets in all of North America. Location After visiting Napa and Sonoma, cruise north in your superyacht along the West Coast and negotiate your way into Puget Sound. Drop anchor in Elliott Bay alongside Seattle and head straight for RN74, the temple to fine modern French/ American cuisine on Fourth Avenue and Pike Street. Why it’s special The restaurant (named after the major road in Burgundy) was founded by celebrity chef Michael Mina, and although its sister establishment in San Francisco has closed, Seattle’s outpost goes from strength to strength, boasting what must surely be the city’s nest wine list. What to look for The 89-page document is truly spectacular and would do credit to the grandest and most famous of European hotels. There are 27 different Nebbiolos from Italy; 39 sweet and fortifed wines; 113 Rhône wines; not to mention 32 red burgundies from Volnay alone; as well as 32 different Washington State wineries in multiple cuvées and vintages. Best bit The five-course tasting menu with wines to match. Top tip After lunch, stroll down to Pike Place Market, generally acknowledged as one of – if not the – finest food markets in all of North America. Location Head 135 nautical miles south from Perth in your superyacht and make for Geographe Bay. Here you can moor up in Busselton, a calm anchorage thanks to the protection of Cape Naturaliste. While here, enjoy the simple delights of the town, including its famed 19th-century 2.4-kilometre wooden jetty complete with underwater observatory. Then hop in a car for Margaret River. 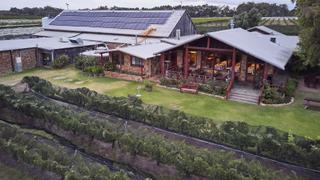 Why it’s special Margaret River might only produce 3 per cent of Australia’s annual wine production, but it accounts for more than 20 per cent of the nation’s premium wine. What to look for Three of Australia’s nest producers can be found here: Cullen Wines, Vasse Felix and Leeuwin Estate. This is a three-stop shop, so make sure you visit them all. Best bit Each of these three wineries has a spectacular restaurant attached, serving remarkable food matched with their wines. Top tip Take a case of each of these wines back to your yacht: 2015 Cullen Wines Vanya Cabernet Sauvignon; 2014 Vasse Felix Tom Cullity Cabernet Sauvignon; 2015 Leeuwin Estate Art Series Chardonnay. Location Head 135 nautical miles south from Perth in your superyacht and make for Geographe Bay. Here you can moor up in Busselton, a calm anchorage thanks to the protection of Cape Naturaliste. While here, enjoy the simple delights of the town, including its famed 19th-century 2.4-kilometre wooden jetty complete with underwater observatory. Then hop in a car for Margaret River. Why it’s special Margaret River might only produce 3 per cent of Australia’s annual wine production, but it accounts for more than 20 per cent of the nation’s premium wine. What to look for Three of Australia’s nest producers can be found here: Cullen Wines, Vasse Felix and Leeuwin Estate. This is a three-stop shop, so make sure you visit them all. Best bit Each of these three wineries has a spectacular restaurant attached, serving remarkable food matched with their wines. Top tip Take a case of each of these wines back to your yacht: 2015 Cullen Wines Vanya Cabernet Sauvignon; 2014 Vasse Felix Tom Cullity Cabernet Sauvignon; 2015 Leeuwin Estate Art Series Chardonnay.